The Healesville Memorial Hall was funded by public subscription as a tribute to local men who served in World War One. It was opened in 1924 by the Governor General Lord Forster. 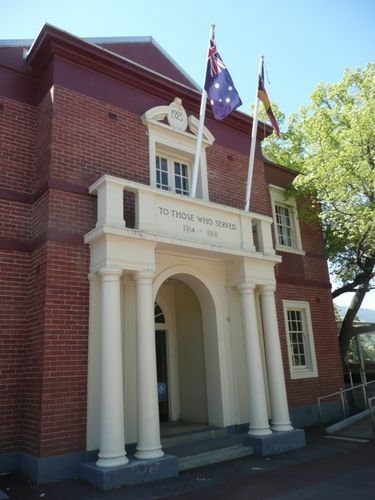 Probably the most important function that has ever taken place in Healesville will come to pass on Wednesday, when the Soldiers' Memorial Hall will be officially opened by His Excellency the Governor General (Lord Forster, P.C. G..M.G.). The memorial buildings which have been erected by the people of the district as a tribute to the memory of those gallant lads who gave their all for their country, will, apart from the sacred significance, be one of the finest buildings of its kind in the State. The people have determined that the opening day shall be a historic one to do justice to the occasion. Public meetings convened by the shire president (Cr. W. J. Dawborn) have been held, and committees appointed. The last meeting of the committee was held on Monday night, when most of the details were arranged. Next Monday evening, 31st inst., the final meeting will be held, and tihe various committees will report progress. It is specially requested that every member attend. At Monday's meeting the president of the Tourist and Progress Association (Cr. E. F. G. Hodges.) on behalf of that body agreed to attend to tlhe street decorating, and he has arranged with Mr. Bloom for the loan of about 200 flags. The committee propose to illuminate the welcome arch near the Grand Hotel on Wednesday night, and they are desirous of receiving co-operation of business people in the matter of street decoration by means of flags, streamers and such like. Mr. E. Press Rich, C.C., scoutmaster, has arranged for a guard of honor composed of boy scouts and girl guides, and school children will sing the National Anthemn on the arrival of the Governor-General. It is unnecessary to urge people to attend the official opening of the memorial, as their sense of duty will direct them towardts this end, but the committee wish it distinctly understood that everyone in the district is cordially invited to be present and show their sympathy with what should prove to be HEALESVILLE'S GREATEST DAY. Healesville and Yarra Glen Guardian (Vic), 29 March 1924.